Canned chickpeas are an essential part of the average vegetarian kitchen store cupboard. Of course, in an ideal world, you soak and cook your chickpeas from scratch but we don’t live in an ideal world and nothing beats the convenience of being able to open a can of chickpeas and make a quick meal. The other day, I was making hummus for a quick after school-snack when I realised I was down to my last last can of chickpeas and I kind of panicked. This never happens – I always have piles of cans of various beans in my ‘waiting for the apocalypse’ over-stocked pantry. I couldn’t rest easy until I went to the supermarket and restocked my pantry – the chickpea crisis was averted and my sense of food security was restored. So, as you can tell, I use chickpeas a lot: in curries, cous cous stews, veggie burgers, soups and, of course, hummus. But nothing beats the old chickpea salad for sheer speed, versatility and wholesome deliciousness. 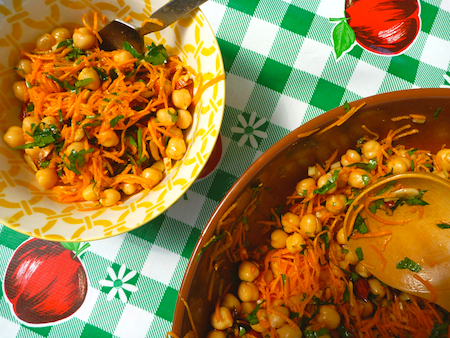 While there are any number of variations of the chickpea salad, this spiced chickpea and carrot salad is one of my new favourites. All the ingredients are fairly basic and are things you probably already have on hand. The first time I made this salad, I thought it had way too much carrot in it. 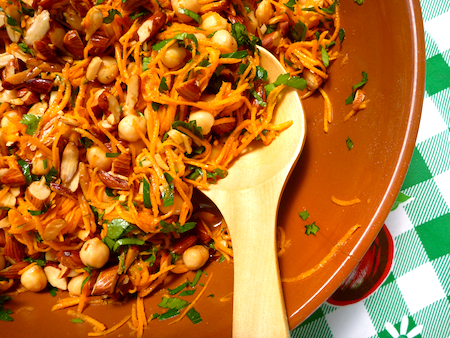 I mean, the chickpeas were swimming in a sea of grated carrot but, in fact, the crunchiness of the carrot, offset by the luxuriousness of the fried almonds is what sets this salad apart. Every time I make it, I find it difficult to stop eating it. You could amp it up a bit with a bit more protein: some feta, egg or tofu but really it doesn’t need it at all, because it makes a perfectly satisfying bowl meal on its own. It’s great to take on a picnic and, like all good chickpea salads, any leftovers make an excellent lunch the next day or even the day after. This recipe is originally from Food & Wine magazine and comes via the wonderfully laid back Canadian food blog ‘Everybody Likes Sandwiches’. Heat 1 tablespoon of light olive oil in a skillet, gently saute and stir almonds until golden. Put nuts aside. Whisk together lemon juice, olive oil, smoked paprika, cayenne pepper, cumin, honey, salt and garlic for the dressing. 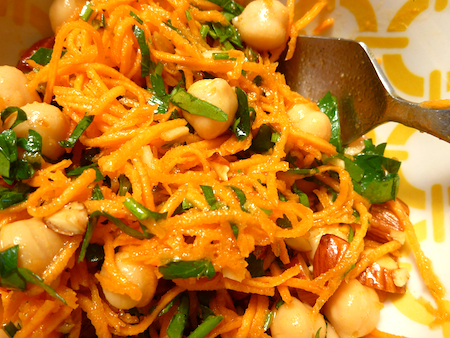 Place chickpeas, carrots, parsley in a large bowl and toss dressing through. Taste and adjust for seasonings. Just before serving add almonds so they remain crunchy.